The TGC series is famous as a magazine because it has no limits nor exact face and appears in unexpected solutions and situations. TGC #3 is subtitled "an unknown audio magazine" and in itself is a particular kind of publishing platform (some may dare say a jukebox). It is experimentally engineered for sonic experiments, instruments, and installations. Each student created a project under the theme "Pushing the Score". The research project is focused on graphic notation, and driven by a desire to update this form of music and sound notation for the 21st century. Starting from the motto ‘from Cage to JODI and beyond’ and from the avant-garde music and sound art of the 20th century, the project researches new audio-visual languages, media and functions of graphic notation in a contemporary context characterised by a fundamental transformation of sound culture and visual culture. 'Rock Step Triple Step' was my personal research within the TGC #3. As a dancer, I was curious why there was no universal graphical notation system in dance. Whether recording past movement for archiving, or writing new choreographies for the future, I focused on which elements of dance are transcribable (like direction or footwork) and which are not. The performance of 'Rock Step Triple Step' began as an experiment based on psychological theory to challenge memory, time perception and flow in dance. The audience has the chance to control the dancers' steps on stage through a web interface which shows my personal approach to graphically representing ten jive steps. Publication part of the Special Issue group projects of the Master of Media Design students from the Piet Zwart Institute, Willem de Kooning Academie, Rotterdam. Experimental Publishing students who contributed to the development and presentation of TGC #3 are: Karina Dukalska, Max Franklin, Giulia de Giovanelli, Clàudia Giralt, Franc González, Margreet Riphagen, Nadine Rotem-Stibbe and Kimmy Spreeuwenberg. 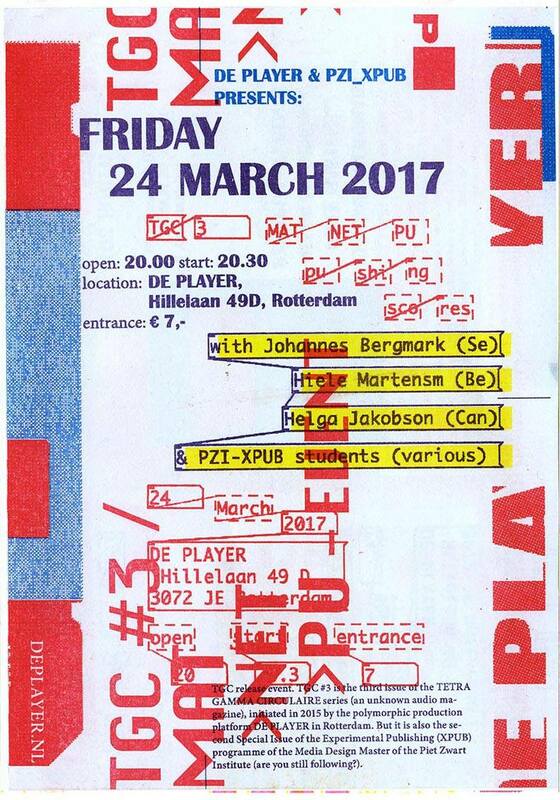 Special guests include Johannes Bergmark, Hiele Martens and Helga Jokobson. For more content visit the official XPUB Special Issues.